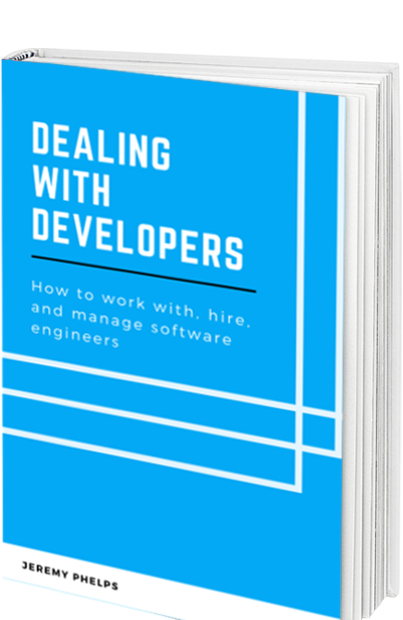 The plain-English e-book that teaches you how to work with, hire, and manage software developers. Coming soon in Q2 2019! In the meantime, I'll send you a brief weekly newsletter with advice and tips to help you deal with developers. I have been a software developer at startups and small businesses for over 10 years. I hold degrees in finance and computer science, so I speak the language of developers and business fluently. My clients consistently rate my ability to translate between the two as my greatest asset, so I've decided to share my talent with the world through Dealing with Developers. Why do developers always give completely inaccurate time estimates? Why do they spend time on stuff that isn't important? And why are they so hard to talk to? You can finally get answers to all these questions in plain English. How to get an accurate timeline, communicate business requirements, and deliver on time. How to help developers like you, or at least avoid annoying them. From freelancers to co-founders, how to find, vet, and onboard great developers. How to keep your developers happy so you can keep them productive and avoid the expensive hiring process. Holding your developers accountable and how to be confident that they're doing great work. Having the right vocabulary is half the battle. I cover the basics so you can speak the same language as your developers. It's almost here! Sign up for the newsletter now to receive 50% off when the book is released. In the meantime, I'll send you a brief weekly newsletter with advice and tips to help you deal with developers.